Friday Apple released an update to IOS, to versions 7.0.6 and 6.16, to fix an SSL Authentication flaw. Indication is that this flaw is easily exploitable, so this update should be applied as soon as practical. Apple has also indicated that this flaw also appears in OS X and that a patch is "coming soon". In the meantime be careful where you browse with your OS X based machines. 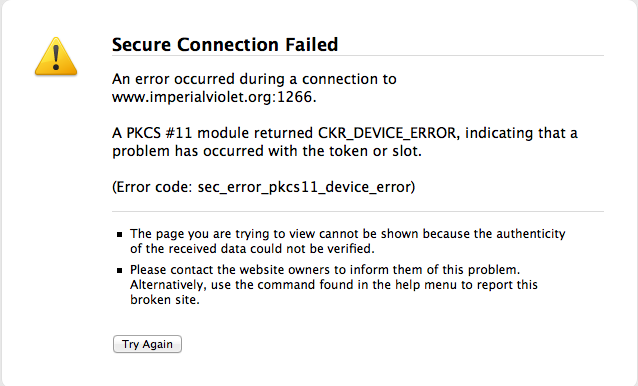 Adam Langley at the ImperialViolet blog has created a test page to help you determine if your browser is vulnerable to this attack. If you can load content from the test page you are at risk, an error indicates you should be ok.
On my two OS X based machines with current versions of Firefox, Chrome and Safari, only Safari displayed the vulnerability. Both Chrome and Firefox appeared to be ok. Below is the Firefox output. Chrome just displayed its "This webpage is not available" error. Researchers have determined that the flaw is caused by an errant goto statement. I realize that, although progress has been made, effective code review, code coverage, and code regression process and tools continue to challenge software development, but this seems like an easy one to catch. Test page doesn't seem to be working? Would the howsmyssl.com site give the same, while more general, information. Can anyone think of why it should take much longer to release the OS X fix than the iOS fix? Writing the patch should be simple: delete the extra goto and rebuild the program, and I don't see why one should require more testing than the other.